The latest version on the Shimano XTR Bottom Bracket shaves 19 grams from the previous model and offers lighter rotation and improved sealing. A smooth bottom bracket that will translate your input into power to the rear wheel is what every rider is after and the Shimano XTR BB93 delivers. What is there to say... It's XTR! This bottom bracket is super light, spins freely and looks great on my bike. The outside edges of the new Hollowtech BBs fit flush with a standard 68mm bottom bracket shell so it looks great on steel bikes. No creaking or any problems, and it's backwards compatible with any Hollowtech-II crank. Not really sure if this is any different from the equivalent XT bottom bracket, but since these hardly ever wear out why not spend the extra ten bucks on XTR? Your bike deserves it. I purchased this to replace a worn out Shimano SM-BB90 bottom bracket. It works well and is very light. FYI: You will need a special bottom bracket tool for this bottom bracket because it is smaller and does not fit standard bottom bracket tool (eg: the Jenson USA 29BB Bottom Tool). I ended up getting the Park Tool BBT-49 Bottom Bracket Tool. After trying a few other bearing sets, I finally gave this one a try and wish I'd started here instead of wasting all that time searching. Absolutely flawless. Had a couple of issues getting the alignment just right, but once it was set all was just great. Smooth, silent, looks great, too. What more could you want. This was the perfect final piece of my full XTR bike build. It feels so smooth and durable that I cannot imagine ever having to replace it. NEVER SEEN A LIGHTER BOTTOM BRACKET!!! WORKS GREAT IN MY MERIDA BIG SEVEN FRAME. worth the extra money. Larger smoother bearings. XTR snootiness. Reliable, still spins super smooth after years of use. Probably have 2000 miles on it through cross country riding. Easy install, no clicking or squeezing. An upgrade to my previous BB on my Mission 3 All Mountain. For all mountain riding in all kinds of conditions the XTR BB93 is holding up nicely. I can't comment on big air and hard hits, 'cause I'm not doing those. For rocky ascent and descent, I'm happy with the performance. After going through multiple Deore bb's pretty quickly I decided to shell out the cash to get the xtr bb and I'm glad I did. Much smoother, lighter, more durable. Worth the money. Replacement for BB52 which started creaking and clicking after 1500km so far no noise at all with the BB93 after a few hundred km, we'll see if it lasts longer than the bb52. Easy install. Great performance. Recommend getting the Park Tool BB-49.2 tool as the plastic tool Shimano includes with does not offer confidence when tightening. In my opinion, you can't go wrong for the money! Easy install. Comes with a tool that fits the Park BBT-9 wrench. Replaced the gritty deore bottom bracket on my tallboy. The black cups are a little smaller than the silver ones. I have taken them apart after a few wet rides and no water seems to have gotten in the frame where as before there would always be some. The bearings are smooth. Still only 2 weeks of riding but the smooth pedaling is wonderful. This replaces my BB93. It's smaller in diameter than the BB93 and comes with the adapter for your BB tool. Everything went together very easily. Other than that it's an XTR BB so what else needs to be said? The outside dimeter is flush with my bottom bracket shell so it just disappears, looks like part of my frame. It is super light and XTR quality seals and bearings for a good price. XTR need i say more! Shipped day of placing order! Brand new packing no problems here. Free shipping love it! After buying from Jenson I wont buy anywhere else! Higher end Shimano stuff just works, period. Previous bb of this type lasted five years, all types of riding. Easy install, everything fits perfectly, no creaks. Best compliment I can give it is, I never have to think about it. A bargain, in my mind. 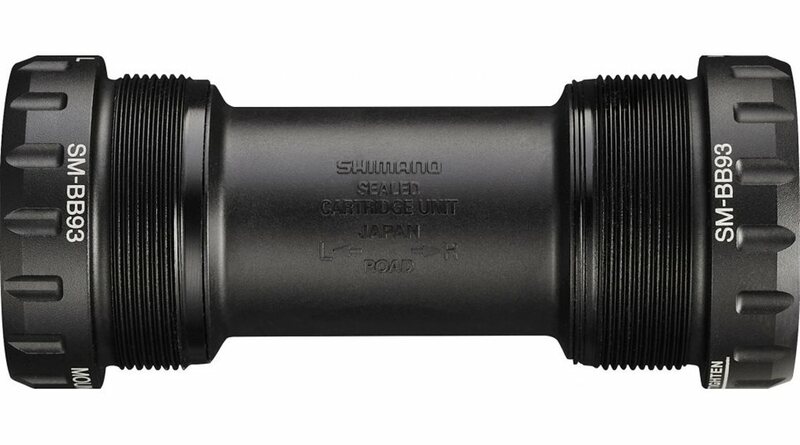 I have always been impressed with Shimano products and this bottom bracket does not disappoint. One feature that stands out is the plastic ring that acts as a buffer between the outer metal surface and bottom bracket tool to prevent scratching. Overall the product is lightweight, installed easily and is very smooth. Thank you Shimano for your continued effort to make great products. I think at this point Shimano bottom brackets are pretty much bomb proof. I haven't used a press fit option but this unit works great on my Rip9. Works good so far no clinking that I was getting from the raceface bottom bracket I replaced. Pound per pound Shimano is still the best value for the money hands down.. But there's always room for improvement.. I wouldn't say that this is the best BB out there, but I needed to replace an existing shimano BB after a season of races and just needed something to get my bike back up and running. It does have decent bearings and seems to turn fine. However, I'm a little suspect of the seals. Overall, for the price, it's a pretty good value. Immediate improvement over the OEM BB30 bracket on my Raleigh. Smoother - will look to see if it's lifespan is better, nice inexpensive upgrade you will appreciate. Given that the BB30 that came OEM was going bad - it addresses the problem very nicely and installs easily. I "feel" that the BB93 is smoother than the original ever was. Good upgrade at a reasonable price. Easy to install out of the box. Put it on a Niner Air9. The plastic adapter did not fit into my BB wrench. It does the job but I had to use channel locks to tighten. So no proper torque. Torque is low on the BB so not a major concern. Bought this for use with new Zee Crankset. I wanted something a little better than the BB50 that came with the Zee. Just 1....the adapter to install this using a traditional external bottom bracket wrench didn't really fit well into mine. I have the socket type (so I can use with torque wrench), and had the adapter slip off 3 times before I had to basically hammer it into the socket so I could install the bottom bracket. Also...plastic adapter seems a bit of a poor choice for installing something you should really torque to spec. Overall, the BB93 is a really nice piece of kit that does the job well once you get it on the bike. It's a bottom bracket I got for a awesome price. I've owned many like it and they have never failed. Product is extremely light. Unfortunately I feel as if the durability is compromised for the weight savings. Great if you're trying to be a weight weenie. Will this BB work on a Santa Cruz Nomad 2? I'm not understanding what English threading is. I currently have a Race Face Ride crankset...your PN CR254A00....and the BB is worn out. Is this a direct replacement? Does it include the Shimano TL-FC24 Bottom Bracket Tool? BEST ANSWER: Yes, it's included. I recommend the cup tool over the wrench.. I have not installed it yet, but I did not see that in the Box. It includes an adapter to use a standard BB tool. It does not, just BB and spacers. The photo shows a bottom bracket with mountain on the cap and road on the case. Which is it? BEST ANSWER: I bought this for my mountain bike a while back. I can't remember of the middle said road or not but it fit my mountain bike just fine. It's still going strong a few seasons later. You will receive a MTB XTR Bottom bracket as described. The sleeve in the middle doesn't really care too much about what kind of bottom bracket it's in. XTR is a mountain bike groupset, so this is intended for MTB. It will work on a road bike with a 24mm crank axle though. This is 100% a mountain bike bb. XTR is by definition mountain. Will this work with the new 9000 series XTR cranks? BEST ANSWER: Yes, both the Shimano and Jenson websites confirm that he BB width is 68 to 73 mm wide. Certainly has worked with my XT cranks. These cranks are so smooth and last longer. Yes, this BB will work with a XTR 9000 series crankset. I'm replacing a shimano BB70 bottom bracket. Is the BB93 interchangable? BEST ANSWER: yes, i just switched my 70 to the 93. both have the same 24mm id. be aware that the ends of the bb are smaller, so your gonna get a bit of a different look and fit to the frame. o.d. on the 70 is 41mm. 93 is 39mm. Will this work on a Mojo HD3 with Hollowtech II crank? It's replacing a Raceface XC.